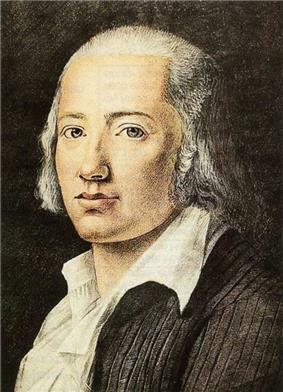 Johann Christian Friedrich Hölderlin (German: ; 20 March 1770 – 7 June 1843) was a major Friedrich Wilhelm Joseph Schelling. Hölderlin was born in Friedrich Wilhelm Joseph Schelling (who had been a fellow-pupil at his first school) and Isaac von Sinclair. It has been speculated that it was probably Hölderlin who brought to Hegel's attention the ideas of Heraclitus about the union of opposites, which the philosopher would develop into his concept of dialectics. Finding he could not sustain a Christian faith, Hölderlin declined to become a minister of religion and worked instead as a private tutor. Michael Hamburger surmised that up to this time, Hölderlin was most influenced by Friedrich Gottlieb Klopstock and his religious verse. In 1793–94 he met Friedrich Schiller and Johann Wolfgang Goethe and began writing his epistolary novel Hyperion. During 1795 he enrolled for a while at the University of Jena where he attended Fichte's classes and met Novalis. As a tutor in Frankfurt am Main from 1796 to 1798 he fell in love with Susette Gontard, the wife of his employer, the banker Jakob Gontard. The feeling was mutual, and this relationship was the most important in Hölderlin's life. Susette is addressed in his poetry under the name of 'Diotima'. Their affair was discovered and Hölderlin was harshly dismissed. He lived in Homburg from 1798 to 1800, meeting Susette in secret once a month and attempting to establish himself as a poet, but was plagued by money worries, having to accept a small allowance from his mother. He worked on a tragedy in the Greek manner, The Death of Empedocles, producing three versions, all unfinished. Already at this time he was diagnosed as suffering from a severe "hypochondria", a condition that would worsen after his last meeting with Susette Gontard in 1800. After a sojourn in Stuttgart, probably working on his translations of Pindar, at the end of 1800 he found further employment as a tutor in Hauptwyl, Switzerland and then, in 1802, in Bordeaux, at the household of the Hamburg consul. His stay in that French city is celebrated in "Andenken" ("Remembrance"), one of his greatest poems. In a few months, however, he returned home on foot via Paris (where he saw genuine Greek sculptures, as opposed to later copies, Roman or modern, for the only time in his life). He arrived home in Nürtingen both physically and mentally exhausted. Susette died from influenza in Frankfurt about the same time. After some time in Nürtingen he was taken to the court of Homburg by Sinclair, who found a sinecure for him as court librarian, but in 1805 Sinclair was denounced as a conspirator and tried for treason. Hölderlin was in danger of being tried too but was declared mentally unfit to stand trial. The state of Hesse-Homburg was dissolved the following year after the Battle of Jena. On 11 September Hölderlin was delivered into the clinic at Tübingen run by Dr Ferdinand Autenrieth, inventor of a mask for the prevention of screaming in the mentally ill. The clinic was attached to the University and the poet Kerner, then studying medicine, was assigned to look after Hölderlin for a while. 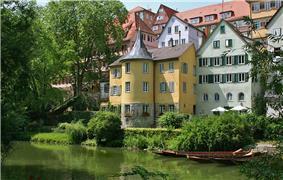 The following year he was discharged as incurable and given three years to live, but was taken in by the carpenter Ernst Zimmer (a cultured man, who had read Hyperion) and given a room in his house in Tübingen, which had been a tower in the old city wall, with a view across the Neckar river and meadows. The tower would later be named the Hölderlinturm, after the poet's 36-year-long stay in the modestly furnished room. His residence in the building made up the second half of his life and is also referred to as the Turmzeit (or "Tower period"). Zimmer and his family cared for Hölderlin until his death in 1843, 36 years later. Wilhelm Waiblinger, a young poet and admirer, left a poignant account of Hölderlin's day-to-day life during these long, empty years. Hölderlin continued to write poetry of a simplicity and formality quite unlike what he had been writing up to 1805. As time went on he became a kind of minor tourist attraction and was visited by curious travelers and autograph-hunters. Often he would play the piano or spontaneously write short verses for such visitors, confining himself to conventional subjects such as Greece, the Seasons, or The Spirit of the Times, pure in versification but almost empty of affect, although a few of these (such as the famous 'The Lines of Life', Die Linien des Lebens, which he wrote out for his carer Zimmer on a piece of wood) have a piercing beauty and have been set to music by many composers. Hölderlin's own family did nothing to support him but instead petitioned (successfully) for his upkeep to be paid by the state. His mother and sister never visited him, and his stepbrother only once. His mother died in 1828: his sister and stepbrother quarrelled over the inheritance, arguing that too large a share had been allotted to Hölderlin, and tried unsuccessfully to have the will overturned in court. Neither of them attended his funeral, nor had the (now famous) friends of his childhood, Hegel and Schelling, had anything to do with him for years; the Zimmer family were his only mourners. His inheritance, including the patrimony left him by his father when he was two, had been kept from him by his mother and was untouched and continually accruing interest. He died a rich man, and never knew it. Indeed, Hölderlin was a man of his time, an early supporter of the French Revolution – in his youth at the Seminary of Tübingen, he and some colleagues from a "republican club" planted a "Tree of Freedom" in the market square, prompting the Grand-Duke himself to admonish the students at the seminary. In his early years he was an enthusiastic supporter of Napoleon, whom he honors in one of his couplets. Like Goethe and Schiller, his older contemporaries, Hölderlin was a fervent admirer of ancient Greek culture, but his understanding of it was very personal. Much later, Friedrich Nietzsche would recognize in him the poet who first acknowledged the Orphic and Dionysian Greece of the mysteries, which he would fuse with the Pietism of his native Swabia in a highly original religious experience. For Hölderlin, the Greek gods were not the plaster figures of conventional classicism, but living, actual presences, wonderfully life-giving though, at the same time, terrifying. He understood and sympathized with the Greek idea of the tragic fall, which he expressed movingly in the last stanza of his "Hyperions Schicksalslied" ("Hyperion's Song of Destiny"). In the great poems of his maturity, Hölderlin would generally adopt a large-scale, expansive and unrhymed style. Together with these long hymns, odes and elegies – which included "Der Archipelagus" ("The Archipelago"), "Brod und Wein" ("Bread and Wine") and "Patmos" – he also cultivated a crisper, more concise manner in epigrams and couplets, and in short poems like the famous "Hälfte des Lebens" ("The Middle of Life"). In the years after his return from Bordeaux he completed some of his greatest poems but also, once they were finished, returned to them repeatedly, creating new and stranger versions sometimes in several layers on the same manuscript, which makes the editing of his works problematic. Some of these later versions (and some later poems) are fragmentary, but they have astonishing intensity. He seems sometimes also to have considered the fragments, even with gaps and unfinished lines and incomplete sentence-structure, to be poems in themselves. This obsessive revising and his stand-alone fragments were once considered evidence of his mental disorder, but they were to prove very influential on later poets such as Paul Celan. In his years of madness, Hölderlin would occasionally pen ingenuous rhymed quatrains, sometimes of a childlike beauty, which he would sign with fantastic names (most often "Scardanelli") and give fictitious dates from the previous or future centuries. 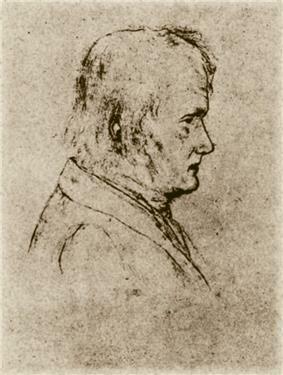 A pencil sketch of Hölderlin done the year before his death. Wilhelm Waiblinger, who visited Hölderlin in his tower repeatedly in 1822-3 and depicted him in the protagonist of his novel Phaëthon, urged the necessity of issuing an edition of his poems and the first collection of his poetry was issued by Ludwig Uhland and C. T. Schwab in 1826. They omitted anything they suspected might be 'touched by insanity'. A copy was given to Hölderlin, but some years later this was stolen by a souvenir-hunter. A second, enlarged edition with a biographical essay appeared in 1842, the year before Hölderlin’s death. Only in 1913 did Rainer Maria Rilke composed his first two Duino Elegies whose form and spirit draw strongly on the hymns and elegies of Hölderlin. Rilke had met von Hellingrath a few years earlier and had seen some of the hymn drafts, and the Duino Elegies heralded the beginning of a new appreciation of Hölderlin's late work. 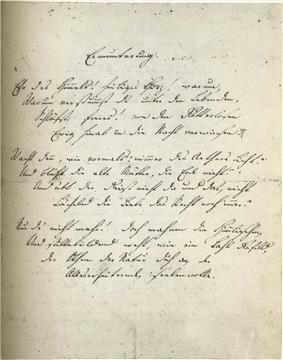 Although his hymns can hardly be imitated, they have become a powerful influence on modern poetry in German and other languages, and are sometimes cited as the very crown of German lyric poetry. The Berlin edition was to some extent superseded by the Stuttgart Edition (Grosse Stuttgarter Ausgabe) edited by Friedrich Beissner and Adolf Beck, which began publication in 1943 and eventually saw completion in 1986. This undertaking was much more rigorous in textual criticism than the Berlin edition and solved many issues of interpretation raised by Hölderlin's unfinished and undated texts (sometimes several versions of the same poem with major differences). Meanwhile a third complete edition, the Frankfurt Critical Edition (Frankfurter Historisch-kritische Ausgabe), began publication in 1975 under the editorship of Dietrich Sattler; it is still in progress. There are other editions; it should be noted that no two of them show all the major poems in congruent textual status. Strophes and readings are sometimes arranged in different ways from one edition to the next. Hölderlin was a poet-thinker who wrote, fragmentarily, on poetic theory and philosophical matters. His theoretical works, such as the essays "Das Werden im Vergehen" ("Becoming in Dissolution") and "Urteil und Sein" ("Judgement and Being") are insightful and important if somewhat tortuous and difficult to parse. They raise many of the key problems also addressed by his Tübingen roommates Hegel and Schelling. And, though his poetry was never "theory-driven", the interpretation and exegesis of some of his more difficult poems has given rise to profound philosophical speculation by thinkers as divergent as Martin Heidegger, Jacques Derrida, Michel Foucault and Theodor Adorno. Hölderlin's poetry has inspired many composers. Many songs of Swedish alternative rock band ALPHA 60 also contain lyrical references to Hölderlin's poetry. Finnish melodic death metal band Insomnium has transposed and used Hölderlin's verses in several songs. Robert Schumann's late piano suite Gesänge der Frühe was inspired by Hölderlin, as was Luigi Nono's string quartet Fragmente-Stille, an Diotima and parts of his opera Prometeo. Josef Matthias Hauer wrote many piano pieces inspired by individual lines of the poems. Paul Hindemith's First Piano Sonata is influenced by Hölderlin's poem Der Main. Hans Werner Henze's Seventh Symphony is partly inspired by Hölderlin. A 1981–82 television drama, Untertänigst Scardanelli (The Loyal Scardanelli), directed by Jonatan Briel in Berlin. A 2004 film, The Ister, is based on Martin Heidegger's 1942 lecture course (published as Hölderlin's Hymn "The Ister"). The film features Jean-Luc Nancy, Philippe Lacoue-Labarthe, Bernard Stiegler, and Hans-Jürgen Syberberg. Many of Hölderlin's work have been recorded as audio books. Notable is a reading by Martin Heidegger for the dedication of the record label ECM. It has released two readings of Hölderlin poets: one in 1984 by Swiss actor Bruno Ganz simply called Hölderlin (ECM 1285), and one in 2012 by voice actor/vocalist Christian Reiner called Turmgedichte (ECM 2285). Furthermore ECM released an album called Scardanelli with spoken texts and music from the 2000 movie of the same name by German director Harald Bergmann. Another example is the 1991 recording of Heinz Holliger's Scardanelli-Zyklus (ECM 1472) conducted by the composer. Friedrich Hölderlins Sämtliche Werke. Ed. Gotthold Friedrich Stäudlin (Berlin: Cotta, 1846). Sämtliche Werke. Ed. Norbert von Hellingrath, Ludwig von Pigenot and Friedrich Seebass. 6 vols. (Berlin: Propyläen, 1913–23 and 1943). Sämtliche Werke. Große Stuttgarter Ausgabe. Ed. Friedrich Beißner (works) and Adolf Beck (letters and documents). 8 vols in 16 parts. (Stuttgart: Cotta, 1943–1985). Sämtliche Werke. Known as the "Kleine Stuttgarter Ausgabe". Ed. Friedrich Beißner. 6 vols. (Stuttgart: Cotta, 1944/1946–1962). Sämtliche Werke. Frankfurter Ausgabe. Ed. D.E. Sattler. 20 vols. (Frankfurt am Main: Stroemfeld, 1975–2003). Sämtliche Werke und Briefe in drei Bänden. Ed. Jochen Schmidt. 3 vols. (Frankfurt am Main: Deutscher Klassiker Verlag, 1992–94). Sämtliche Werke und Briefe. Ed. Michael Knaupp. 3 vols. (München: Hanser, 1992–1993).